Francesco Deiana is an Italian artist, living and working in San Francisco for many years. His new work at Aimee Friberg’s CULT gallery is all about contradictions. 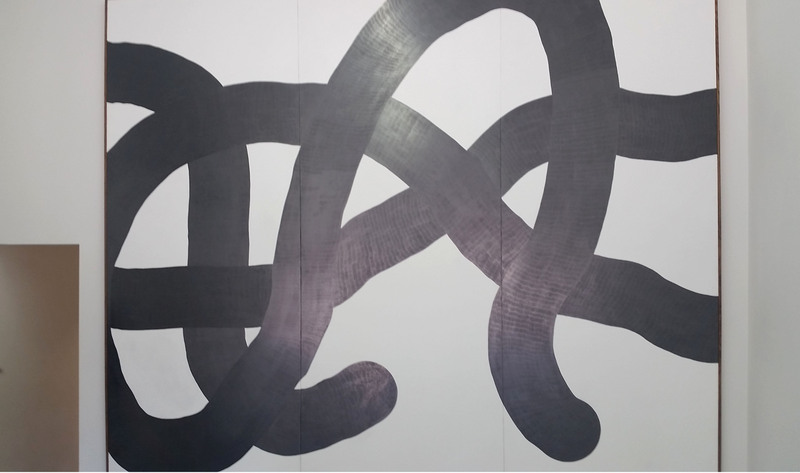 Deiana designs large scale shapes relating to historical works ranging from Franz Kline’s gestural works to the geometries of Stella and Tuttle. 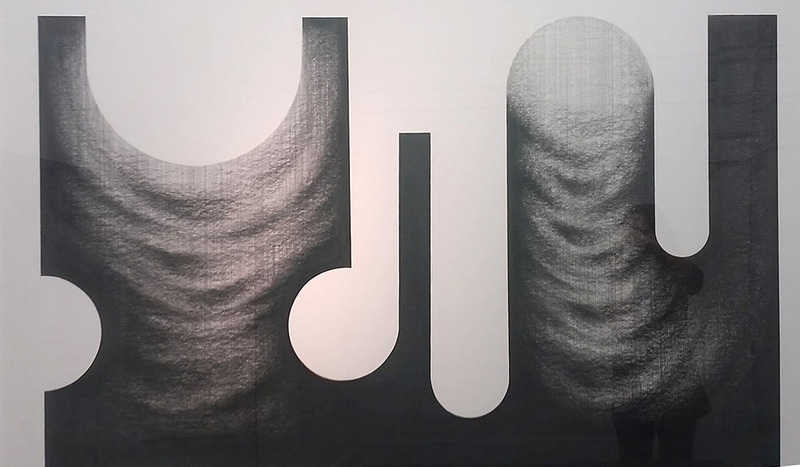 Carefully covering them with graphite marks, he creates trompe-l’œil imagery of interference patterns, which he transfers from his computer screen. Recently I had the opportunity to speak to him about his work. FD: I find really interesting the process of translation between the digital and analog images, which was always part of my work. I like the idea of confusing the eye, not knowing if my work was done by hand or by computer. I took this idea to the limit in this show basically as I combined computer images with graphite drawings. FD: For these works I design most of the outlines in my sketchbook first. Then I reproduce them in large scale, outlining the shapes and filling in the black areas on a table. Step two is to hang the piece on a wall to give me the possibility to step back for proportions. I draw the wave patterns in it, copying it from the distortion created on my photographs shot through my computer screen. Step three is to put back the piece on a table and cross the whole thing with lines done with ruler and pencil to give you the idea of something machine made (computer or copy machine) and also to give a heavy texture to the drawing. The entire work is done with graphite. I love the fact that you can see my hand-work in them. Looking at these waves, your imagination can go through it. As a viewer, you wonder right away how is it done. You can also imagine these waves looking like fabric surfaces or sonar waves. FD: I started here by drawing a shape with my finger in one continuous movement using Photoshop. It’s a gesture digitally done and reproduced by hand with a body move instead using a finger because the scale of it; but it’s a gesture in the same way. The entire piece is filled up using pencils/ graphite sticks. 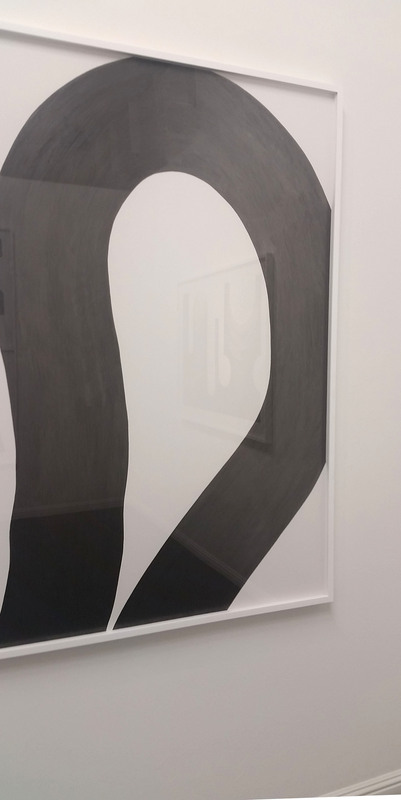 The graphite looked layered on the gesso surface, showing the overlap of the shapes in the big work. It was the idea of gestural work in Photoshop that was interesting to me, and reproducing it on a large scale was such a time consuming work with an intense result. FD: My sculpture began with a projected shape on a found object, which I painted and coated with graphite. 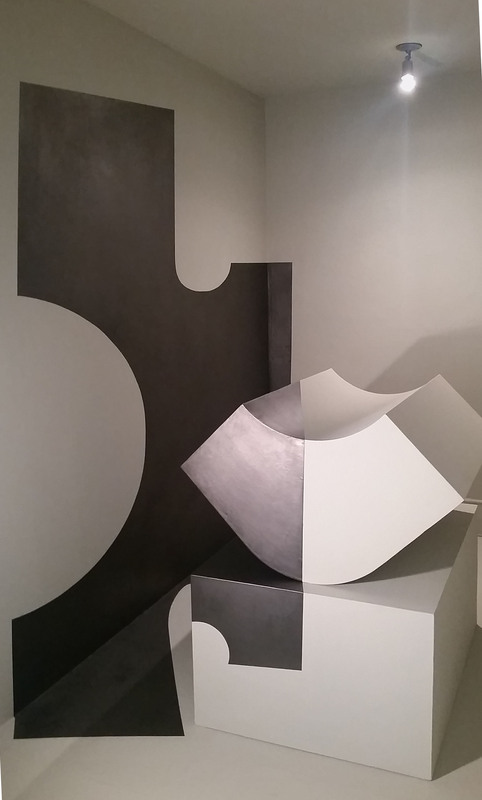 The piece is closed in a room and you can only look at it from the entrance. That way it will limit the points of view you can see it from and give more space to your imagination. I painted the room and sculpture all gray as it is in the computer programs for 3D renders. I wanted it to be read as a three dimensional sketch of my two dimensional work for a potential sculpture; to be then reproduced in steel and in a bigger scale. FD: My shapes are an evolution of my designs. Every shape is different, sometimes they are related to architecture. As I said I see many of my drawings as the models for potential sculptures. I envision them as huge metal cuts. The influence from architecture has to do with the fact that I am Italian and where I grew up. I think my work is really strong, almost invasive for your eyes in a way. It’s aggressive and kind of extreme but there are also soft and delicate parts in it. It almost feels like a contradiction. For example, the wave- shapes looks almost like fabric while, on the other hand, the shape that encloses them is solid and heavy. I started to make this series of works last year after I visited Rome where I helped a friend with his show. We were surrounded with good art and artists from the 1960s to the 1980’s . I had access to a lot of inspiring art and people. Artists like Mario Schifano, Lucio Fontana, Sol Lewitt, Joan Jones, Pat Steir… Their work was really inspiring. MG: You process seems to be about the risk. You are taking the work physically to the edge where it can be ruined just by any small error you make. FD: It is true, my process reflects a lot of who I am. At the beginning of my career when I was doing a lot of shading with ballpoint pens, my rule was not to make any visible mistakes for my eyes at a distance of like one inch from the paper. This way the work would almost look dimensional/ mechanical from faraway, almost computer made. Still, even as my work can look very precise it’s full of imperfections, miscalculations and sometimes very off results. In reality I don’t calculate much, I just draw all my shapes, overlapping my rulers for sizes and using a cord and nails to do the circle parts. I am trying to get better at calculating what is happening with my pieces but they are pretty freely made.